To receive email from Indigenous Environmental Network, add media@ienearth.org to your safe sender list. Cannon Ball, North Dakota - On Monday, North Dakota news outlet WDAY-TV published a report on a #NoDAPL action in North Dakota that occurred the day prior. The report alleges a private security guard was “assaulted” and “carried by” protesters at a Dakota Access construction site. There is no proof of the incident - the hundreds of photos and live video shot of the demonstration all show an entirely peaceful day. As documented on Sunday, hundreds of indigenous peoples, organizations, and allies gathered in peaceful opposition to the Dakota Access Pipeline. 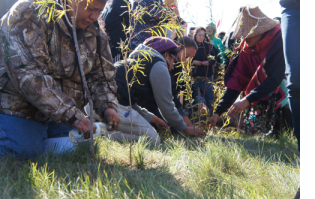 Native women and youth planted willow trees in the path of the pipeline. 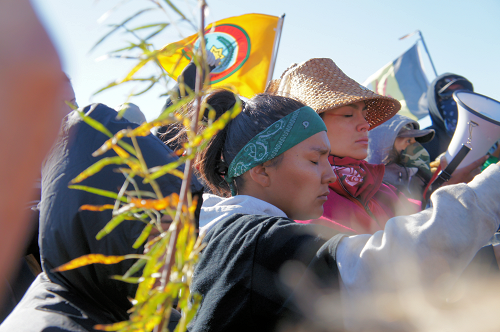 Prayers and songs by the protectors were in stark contrast to the helicopters flying overhead and police presence. Elders spoke of protecting the water, and the significance of the willow trees. 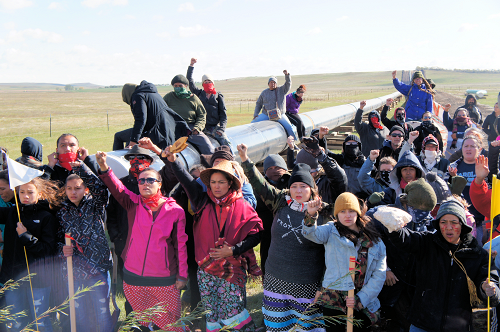 “Despite continuing efforts of local media to paint us as aggressors and the pipeline’s construction as inactive, protectors are united in non-violent direct action to stop this destructive project. The company has sicced dogs and used mace on Native women and children to protect its fossil fuel investment, but we fight with our prayers and love for seventh generation. 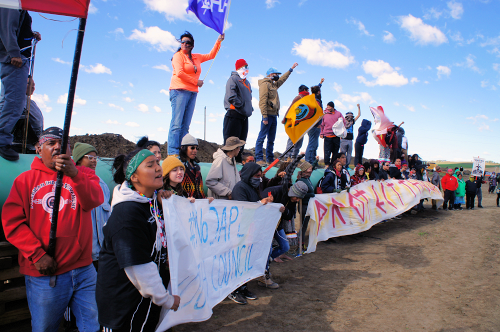 Dakota Access hasn't stopped construction, they've upped their efforts with a six to seven day work week, and purchase of Cannonball Ranch, land with numerous sacred sites that is right next to where they plan to drill under the river,” said Tara Houska, National Campaigns Director of Honor the Earth. 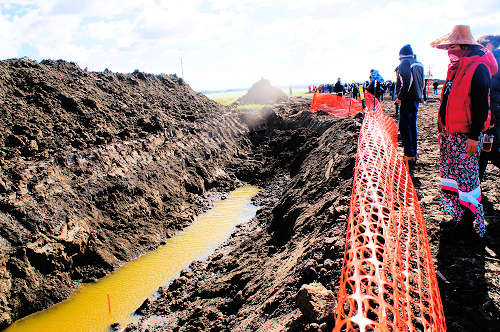 The same day, organizers opposed to the Dakota Access Pipeline project movement identified a construction site near Redfield, South Dakota. 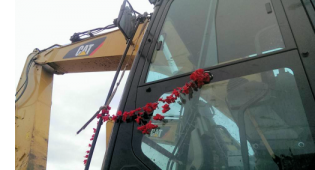 They placed one thousand traditional prayer ties at the construction site in peaceful direct action to permanently stop the construction of the pipeline. "In support of all the tribes who have been praying and Yankton Sioux Tribe's filing for injunction against Dakota Access pipeline we came down to lend our support in resistance to this evil monster. Do not think that this fight is done. We will be watching you and we know the grave injustices Energy Transfer has done to the people to the earth and the threat to sacred water.” explained Joye Braun, citizen of the Cheyenne River Sioux Tribe and frontline organizer with the Indigenous Environmental Network. 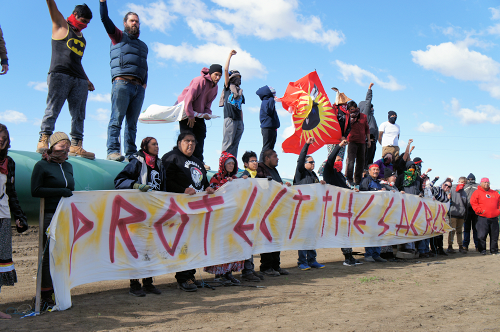 The two actions in North and South Dakota were peaceful and no arrests were made. However, in Iowa 12 arrests were made on Saturday, September 24, at the Mississippi River access point for the Dakota Access Pipeline where the group Mississippi Stand has recently set up an encampment to resist the construction of the pipeline. “Over 100 Iowans have been arrested so far in direct actions against this crude oil threat to our drinking water. We won’t rest until the pipeline has been stopped in Standing Rock and in Iowa. We won’t rest until all the Rivers are protected. We won’t rest until future generations are guaranteed clean water. We won’t rest until the Tribes have gotten justice,” said Carolyn Raffensperger, executive director of the Science and Environmental Health Network.